The user preferable Online Car Classified Script is analyzed, hand-picked the major integration listings feature from the major car listings sites with user-recommend features and car efficiency search and it is developed by our experts with the new advanced listing features and car comparison functionality. 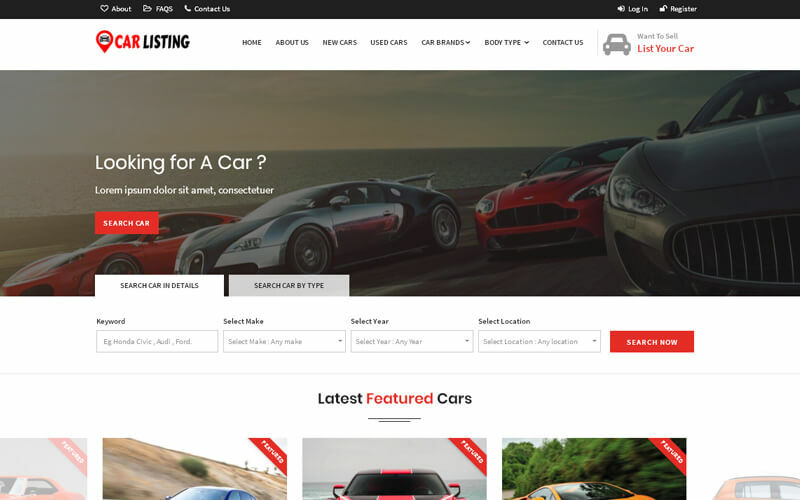 This Auto Classifieds Listing Script is mainly developed for the professional’s car traders who are very interested in dealing buying and selling the cars in world-class professionalized car listing script with user business understandings, this script is a great on-sale demand among the car sellers and buyers entrepreneurs and also for the new entrepreneurs. It is the good start for the new entrepreneurs to kick-start their own car listing online business without any technical knowledge about the script. The Car Portal PHP Script can be customized as globally or localized listing script based on the user requirement, the users can register their profile with the valid mail id and password, where Two Factor Authentication secure method is used which is highly recommend in higher professionals sites, to make the account more secure, after the user successfully log in to the system where they can find the listings features with advanced search options like search car with details and search car by type. It is made convenient for the users to search the car by entering the keyword, brand, year, and location which get the accurate response for the user query. This Car Classified Script is the best car listing market campaign to sell the car with high and efficient user benefits, the users can list their cars with details, images, video, model, year and conditions etc they can easily manage their profile and can upgrade their membership plans. It is made easy for the buyers to search the car with advanced search options by adding the product to the cart and also by applying the coupon code and can make the online payment by using our secure gateway integration which is made feel free and efficient for the users. In this Auto Classifieds Listing Script, the entire site can be managed and controlled by the admin, where all the user management, order management, coupon management, shipping status are monitored and managed by the admin. The admin has the authority to grant permission the user account, post and listings, comments etc. It is also designed in such a way that the admin can manage all the resources of the site with the necessary managing tools. This Car Portal Classified Script is the best revenue generating script where the admin can get more profits by using the banner ads, Google ads and Ad sense etc in the site. The site optimized as per the Google standard algorithms and also developed with SEO-Friendly, Mobile-Friendly site. We have more than 4000+ clients from all around the globes with our user satisfying service and pride in delivering the products and by doing 24*7 helpline services. In addition to the script, we provide 1-year technical support, 6-months software free update, and brand free site. Onetime Payment: – Once you make the full payment, we will provide you with the entire script files. Nothing has to be paid by you thereafter. I am very much impressed with this script. It really helped my car selling business. Now my customers are easily known about my car models, features, price and location using this script. It helped me a lot thank you guys I never forget about your teams. Guys if you want successful business just buy this script from PHP Script Mall. After that they take all the responsibility for your success. The design and layout of this script is awesome! This script helped to improve my customer easily. They are provides the incredible support team. I had some problem so I contact their technical team they solved within an hour.